Last week it snowed in Seattle, which means all kinds of fantastic things: working from home under the electric blanket, listening to the list of closures on the local news, and being home early enough to cook dinner. Since Dylan and I were both home we decided to attempt an ambitious weeknight dinner — ravioli from The Mozza Cookbook. Single-serving-sized ravioli with a runny egg yolk topped with a fried sage leaf and brown butter sauce felt a little two years ago to blog about, but I don’t care. We used fresh goat ricotta, sage harvested from our snowy yard, and an obscene number of eggs. 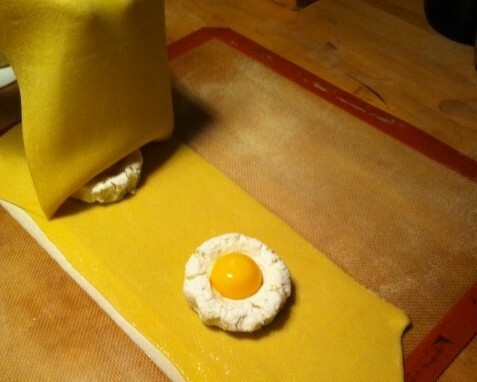 All told, the recipe called for 17 eggs: 9 in the pasta dough and 8 to fill the ravioli.Â It was magnificent, but definitely not a typical weeknight dinner. We started cooking at 5pm and by 8pm we were eating the ravioli with a side of braised kale. Our friends in Chicago decided to tie the civil union knot on New Year’s Eve this year, so we went to Chicago to celebrate with them. So much delicious food was consumed. Being former vegetarians we were pleasantly surprised at the vast number of vegetarian choices, but we also indulged our carnivore-ness. Our best meals were happy accidents, as a few of our intended destinations were closed for a New Year’s break. Here’s the tasty rundown. FountainheadÂ - We went there mostly for the beer, but the food wasn’t bad. I had a couple glasses of the St. Louis Guezue Fond Tradition and the roasted broccoli over quinoa and a red pepper puree. I’m a sucker for broccoli. Pick Me Up Cafe – Sadly, the wait atÂ The Chicago DinerÂ was too long and we were on a schedule, so we walked over to the Pick Me Up Cafe instead. The Pick Me Up didn’t disappoint. I had the bbq seitan sandwich with fries and a side of broccoli (!). The sandwich was big, sloppy, and had to be eaten with a knife and fork. The side of broccoli was huge and came swimming in minced garlic. I didn’t mind so much, but I’m sure the poor ladies at the Urban Decay makeup counter several hours later did! Karen’s on GreenÂ - We enjoyed a 5-course vegan dinner on New Year’s Eve: roasted brussels sprouts, sunchoke bisque with black truffle oil, a spinach salad, crab cakes with farro, and coconut macaroons. Simply listing the courses doesn’t do the meal justice, because it was all so delicious. The stand out dish was the “crab” cakes. I’m not 100-percent sure of what was used to mimic crab, but I suspect that it was rehydrated yuba, bound with pureed tofu, breaded, and seasoned with a generous amount of lemon rind. It was spectacular. Karen’s Cooked – Karen is a vegan powerhouse in Chicago. We had no choice but to succumb to her powers and have brunch at her casual establishment Karen’s Cooked (not to be confused with her raw restaurant, Karen’s Raw Cafe). I highly recommend the bread pudding, but be warned, it is a gloriously large portion. GaylordÂ - I’m certain there is much better Indian food to be had in Chicago, but Gaylord was a block from the hotel, which was about as far as we were willing to venture out that particularly cold and blustery night. They had a complimentary salad bar that featured carrot and cucumber sticks, roasted beets, chutneys, and a bright and spicy carrot pickle. We had the vegetarian thali with a great saag paneer that had a distinctly pleasant coconuttiness. Bar Toma – Bar Toma was a paradox, as it provided much pleasure and much disappointment. In a fit of extravagance, I ordered for a starter the whole burrata with black truffles ($60!). It was served by no fewer than three people: one gentleman presented the luscious ball on a wood board and splayed it open for us, another gentleman brandished an oversized pepper grinder and gave it a few expert turns, and finally another more distinguished gentleman (he sported a chef’s coat, while the other two were in tshirts), proceeded to shower the cheese in black truffle shavings. Good god that cheese was creamy and it was the first time that I’ve been showered in freshly shaved truffles.Â So that was the pleasurable part of the meal. It gives me much sadness to report that the pizza was a disappointment. While the crust was well seasoned, it was dense and rubbery. I had such high expectations. And that’s all I’ll say about that. Avec – So we wanted to go to Girl and the Goat, but they were closed for a New Year’s break (as we found was the case with many places in Chicago). Thankfully Dylan spotted Avec just a few doors down. It was a gem. 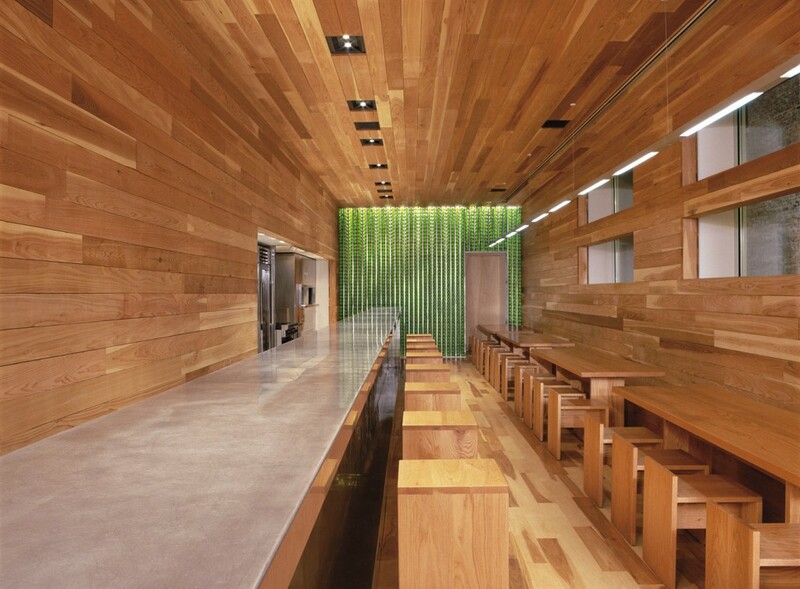 The space was long and narrow, all wood panel and stainless steel, and suited our PNW sensibilities. We sat at the bar, drank wine, and shared three small plates that blew our minds. First we had roasted brussels sprouts with crispy brisket, pumpernickel, roasted quince, walnuts and mustard vinaigrette. Every bite had a perfect balance of flavors and texture and oh gawd that brisket. Next wasÂ roasted squid with san marzano tomatoes, guanciale, fideo and saffron aioli which had a pleasing seafood funk, was intensely red and juicy, and surprisingly spicy. Last wasÂ marinated hanger steak with puy lentils, melted bone marrow, spinach, tomato, oranges and fried capers. The yumminess of this dish made us weak with joy. The steak was perfectly cooked, sinewy and seared to rare. The lentils were smokey and glossed with marrow. We want to live at Avec. Jam – This was our last meal on the way out of town. We intended to go to Longman and EagleÂ for brunch but discovered that they were closed for a New Year’s break. Jam’s chef was at Charlie Trotter’s, so not surprisingly the food was good. The whole place was white, glass, and lime green and reeked of freshly squeezed oranges. I had the corned beef sandwich with horseradish cream on marbled rye with potato salad. Dylan had a smoked ham and gruyere omelette with roasted brussels sprouts (oh man, I just realized there were brussels sprouts consumed nearly every day we were in Chicago! ).